Often, experienced computer users will tend to take their hardware components to a higher limit; hence, they tend to over-clock their components. First of all, the definition of over-clocking ? Over-clocking simply refers to letting a hardware component run at a much higher speed than as recommended by the manufacturer. Therefore, over-clocking needs to be taken seriously as it may void your warranty, or in some cases, even damage your hardware components, rendering them useless. However, over-clocking is not just an act for the experienced end user. 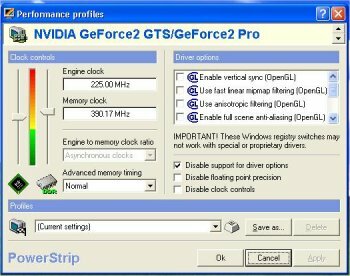 Almost anyone could attempt an over-clock to hardware, and in this article, I am going to discuss how to go about over-clocking a display card, also known as the VGA card or graphics card, and in the proper manner. I have to declare once again that, for any over-clocking activity that takes place; it could very well void your warranty and damage your hardware. 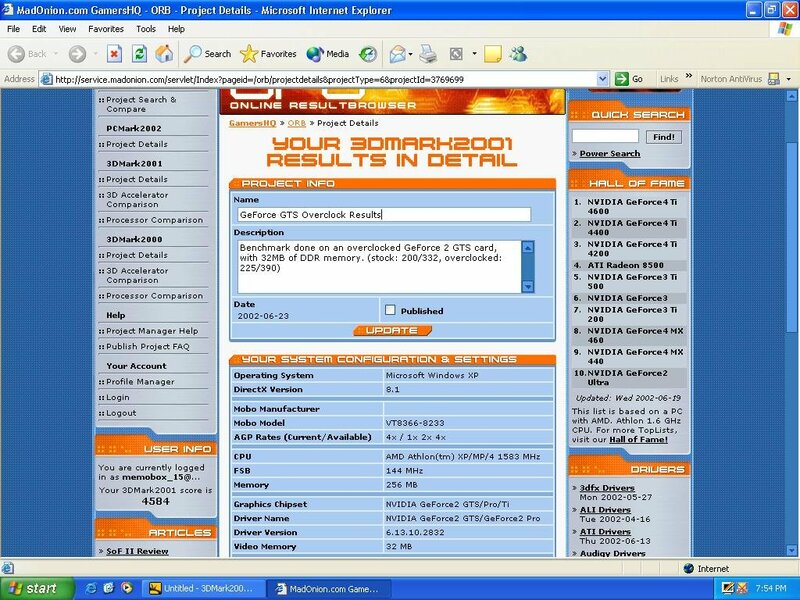 The display card that is used in this article is an Inno3D Tornado GeForce2 GTS with 32 MB of DDR memory. (Courtesy of Krado) The tools used to over-clock the card are purely software based. Popular display cards over-clocking utilities are Power Strip, GTU (GeForce Tweak Utility) or the Cool Bits driver add-on, which can be found and downloaded easily using the search engines found on the Internet. In this article, I am going to use the easiest-to-use utility to over-clock the card ? Power Strip. Power Strip is a multi-purpose display card tweaking utility that can not only let you adjust the core and memory speeds of the card, but also adjusts the refresh rate of your monitor with accuracy right down to 0.001 Hz. It also features application ?memory? functions that remembers the display card settings for each particular application and automatically adjusts the card to the pre-programmed settings upon the execution of that particular application. Due to its user-friendly interface, Power Strip is the perfect tool for over-clocking a display card for beginners. The benchmark software used is none other than the vastly popular program, the 3D Mark 2001 SE. Most over-clockers will almost certainly get their hands on over-clocking both the memory and the core clocks at any one time, or alternating between the two values. This is a habit that I discourage to do so. To really find out the maximum values that the display card can reach, it is best to adjust either the core or the memory at any one time only. For example, I would start working on the memory clock first, pushing it up till the card becomes unstable, and then lowering the clock to the most recent ?stable point?. With that, I would obtain the highest possible memory clock of the card, while maintaining its stability. After tweaking the memory, I would then switch to concentrate on the core clock, and again, following the steps described for the memory clock above to get the highest possible core clock and stability. After the whole over-clocking process, which consists of two parts ? one for the memory clock and one for the core clock, I would then lower both the clocks by another 10 MHz to strike a balance between speed, stability and the display card?s life. This is a measure that I always recommend. As with all over-clocking processes, heat is the most important factor to consider, as it will decide whether your card will run well, or will it be prematurely damaged during the over-clocking processes itself. So, it is prudent to prepare some cooling options available prior to attempting the over-clock. The GeForce2 GTS in this case, is cooled by a 5300rpm CoolerMaster fan used on an aluminum heat sink, and a secondary CoolerMaster chipset fan, plus the default cooler and heat sink configuration. This makes sure that the card can be over-clocked safely, reducing the chances of it being damaged by heat. Of course, some really takes the effort to even affix heat sinks on the ram chips, and adding more thermal paste to the GPU (Graphics Processing Unit) core, which is even better for heat dissipation. With all the cooling options in place, and Power Strip installed, it?s time to see how fast the GeForce2 GTS can go. Due to the fact that the GeForce2 series of cards actually lack more memory bandwidth (speed) than the core speed, and from experience, increasing the GeForce2?s core speed by itself does not provide much of a performance increase, I decided to go for the memory clock first. For a start, the memory clock of the Samsung rams that were on the card is at 333 MHz (DDR), and the core at 200 MHz respectively. 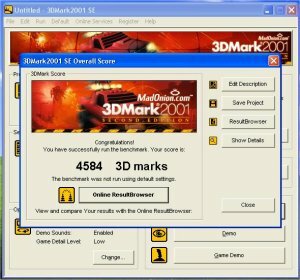 I started pushing the memory clock by 20 MHz increments each time, and ran 3D Mark 2001 SE after each and every increment to test for stability. Eventually, I found out that the memory could only be pushed to 390 MHz to be stable, and finish the benchmark without any image distortions. Note that although the memory can be clocked further up (till 400 MHz) to achieve higher FPS (Frame rate Per Second), the benchmark will run with heavy image distortions, which defeats the purpose of over-clocking the card. Remember that the over-clocking of a display card is not solely for the increased FPS, but also for that of image quality. Click here to see the submitted benchmarks score. *Remember, we are not responsible to any damages that may happen including voidance of warranty, hardware/ software or you screwing up your own PC after reading and applying steps found to this article.